Tentative Schedule! – Make plans today! Conference Registrations! – Register now and pay online! Hotel reservations! – Check it out! Transportation Information! – Make sure you can get there! Silent Auction Information! – Donate your stuff today! Alström Syndrome is a rare hereditary genetic disorder first described by C.H. Alström in Sweden in 1959. Alström Syndrome can affect people of all nationalities, ethnic groups, and races. We currently have identified approximately 1053 individuals with Alström Syndrome in sixty four different countries and maintain an ongoing patient and genetic ALMS1 mutation database. 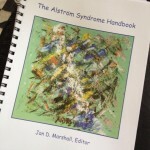 The Alström Syndrome Handbook is now available. Please contact the ASI Office to request a copy, or download a digital copy (PDF). If you have just received a diagnosis of Alström Syndrome for you or a member of your family, or if you are concerned that you or your child might have Alström Syndrome, please read this first: Information for New Families. Alström Research Connect and Family Exchange Launches! Look here for more information on ARC! The information provided on this site is designed to support, not replace, the relationship that exists between a patient or site visitor and his or her physician. Additional information about this site is available here. 501 (c) (3) Registered Charity.